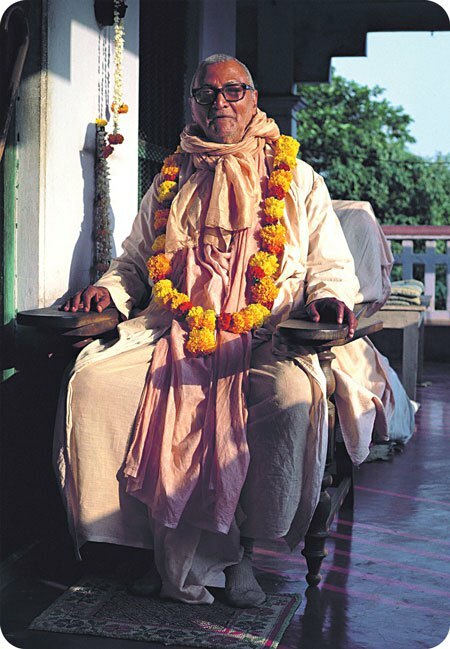 Literally the word Prabhupada can be divided into two parts. 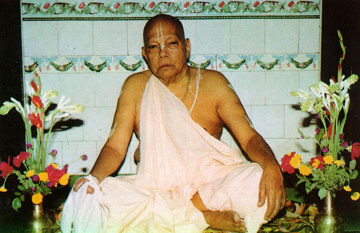 One part is ʻPrabhu‘, which means ʻLordʼ. The second part is ‘padaʼ, which means ʻfeetʼ. In order to honor the Lordʼs feet, an ornamental word, ʻlotusʼ is used to glorify His feet. In the Vaishnava cultural tradition, devotees use the words lotus-feet to describe the feet of their Lord. Groups of different faiths use the word Prabhu to refer to their object of faith. 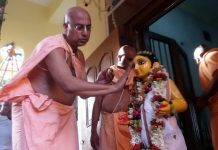 Amongst Gaudiya-Vaishnava devotees, the use of Prabhu indicates Sri Krishna Chaitanya Mahaprabhu, who was born in the year 1486 at Mayapur, Nadia, West-Bengal, India. He was known by different names: Nimai, Vishwambhar, Gauranga etc. According to Gaudiya-Vaishnava scriptural evidence He is Krishna himself in the form of Sri Krishna Chaitanya Mahaprabhu. In this age of quarrel, hypocrisy, ignorance and darkness, which we call the Kali-Yuga, Sri Krishna Chaitanya Mahaprabhu took a vow of renunciation in order to teach people how to surrender to the lotus feet of Krishna and get His divine love in this age of Kali. This vow of renunciation is called tridandi-sannyasa. Here tridandi means “three” and refers to body, mind and speech. Sannyasa means one who is fully removed from material attachments and fully surrendered in body, mind and speech to the service of the Divine Couple, Sri Sri Radha-Krishna. 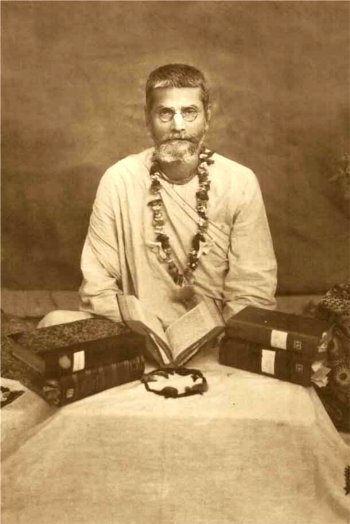 After taking Sannyasa, Nimai or Vishwambhar, as he was known, was named Sri Krishna Chaitanya. Gaudiya-Vaishnava devotees use another ornamental word, ʻMahaprabhuʼ, after His name to glorify Him. ʻMahaʼ means great. In order to respect the Sannyasa name of their Lord He was called Sri Krishna Chaitanya Mahaprabhu. Lord Ramachandra is the incarnation of honor (maryada-purushottam) and Lord Krishna is the incarnation of pastimes (lila-purushottam). 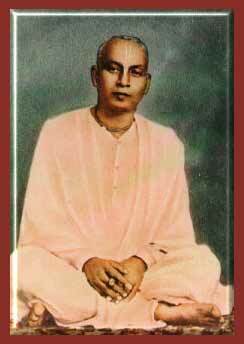 For the Gaudiya-Vaishnavas, Sri Krishna Chaitanya Mahaprabhu is the incarnation of divine love (prema-purushottam). The Gaudiya-Vaishnavaʼs object of faith is Sri Krishna Chaitanya Mahaprabhu. For Gaudiya-Vaisnava devotees, the addition of the word Prabhupada glorifies the lotus feet of Sri Krishna Chaitanya Mahaprabhu. 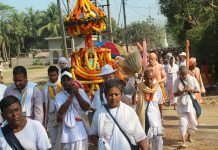 The inner meaning of Prabhupada for Gaudiya-Vaisnava devotees exemplifies the manner in which the loving message of Sri Krishna Chaitanya Mahaprabhu is carried. Another meaning of the word Prabhupada refers to one who is fully surrendered to spreading the loving message of Mahaprabhu with integrity. 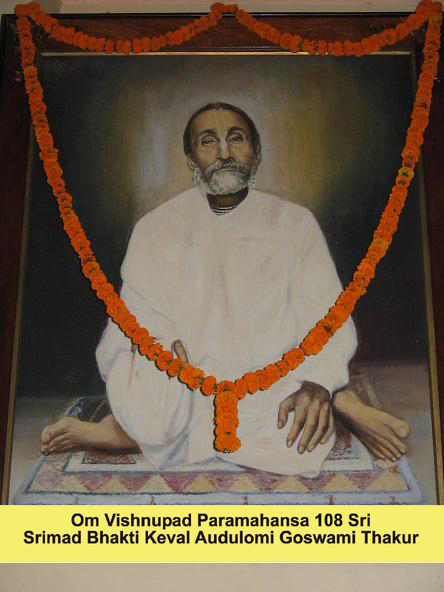 Out of humility and in order to maintain special respect for their spiritual master, His Divine Grace Srila Bhakti Siddhanta Saraswati Goswami Thakur Prabhupada’s disciples(almost all) did not allow anybody to use the title ‘Prabhupada’ with their names. In light of the above discussion it is true, all pure devotees who carry the loving message of Sri Krishna Chaitanya Mahaprabhu with integrity are qualified to use the title ʻPrabhupadaʼ with their names. 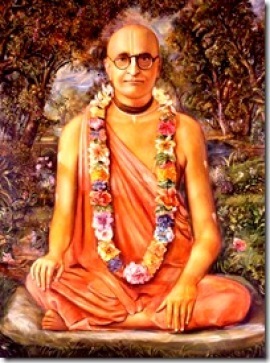 All of the above Vaishnavas are disciples of His Divine Grace Srila Bhakti Siddhanta Saraswati Goswami Thakur Prabhupada. 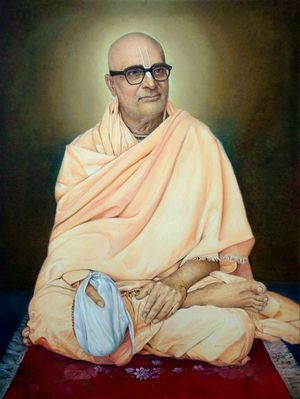 Another one of His disciples, His Divine Grace Srila Bhakti Vedanta Swami Maharaj, founded the International Society for Krishna-Consciousness, ISKCON. 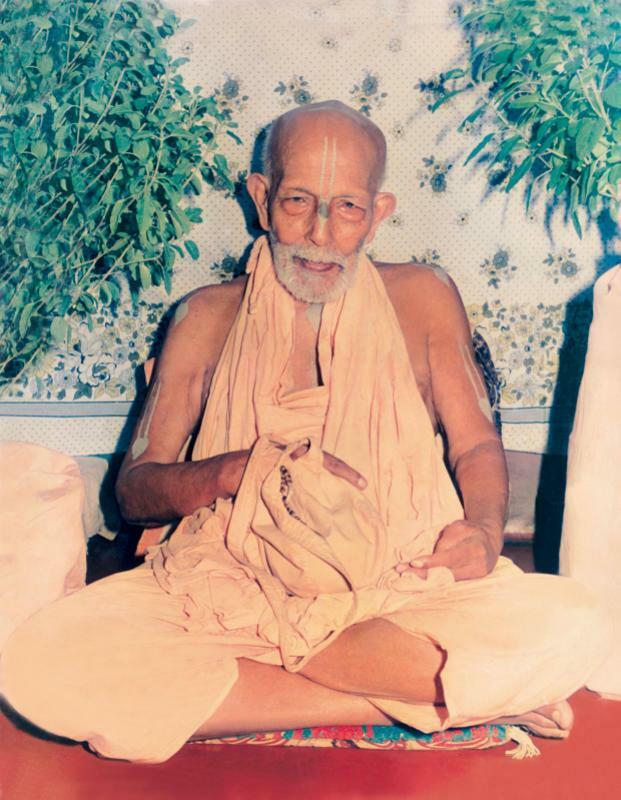 He allowed his disciples to use the title ‘Prabhupada’ for him. This is an exceptional and special case. 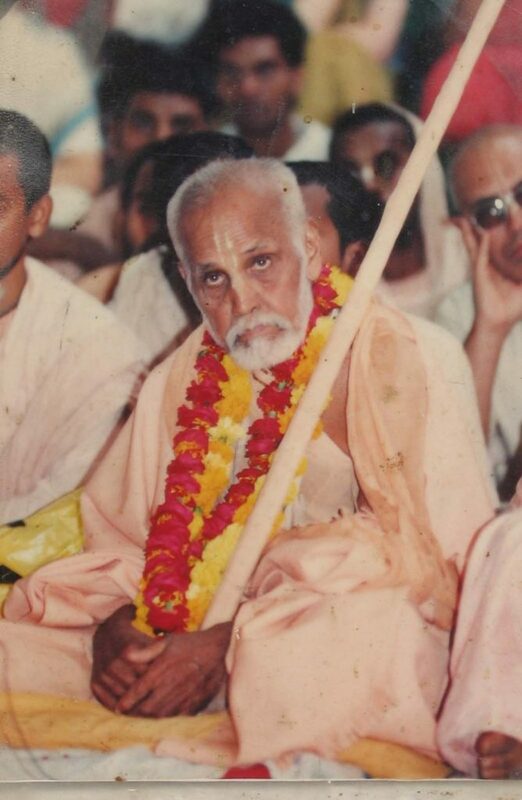 Taking the shelter of ‘Prabhupada’ is extremely important for Gaudiya-Vaishnava devotees. 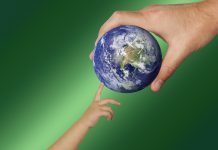 Without the mercy of ‘Prabhupada’ spiritual progress is impossible.